All I wanted to do was to replace the skirting board in the hall with a metal kick plate, so that bands wheeling amps and speaker cabinets into the studio wouldn’t damage the wall. My business partner, Paul, who has been doing much of the redecoration and repairs to the studio was given this task, and as usual, it turned out to be rather more work than he anticipated. 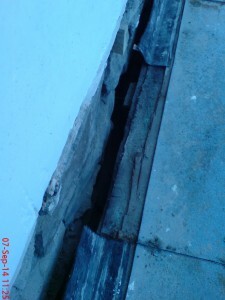 Once the old skirting was removed, he discovered that none of the joists met the wall! A neighbour, who is a builder also took a look and neither of them could understand how my studio was suspended over a chasm with no visible means of support! The result is that I’ve now had to spend a considerable amount of money to install extra support for the sagging floor. The good news is that at least I’ll end up with a new floor surface in the hall. The industrial floor covering that was fitted when it was a bakery, is looking drab in comparison to the new white walls and bamboo flooring in the live room and reception area.